It’s hard to say why a particular work of art affects you. For example, I always find myself moved when I’m in front of a Mark Rothko painting, but if I had to literally describe what the painting was, it would hardly make sense. Oddly, this wooden, hand-made air-cooled Volkswagen engine, while about as different from a Rothko as humanly possible, I also find astounding. Sure, it’s for remarkably different reasons, but the intensity is still powerful. I mean, look at this thing. 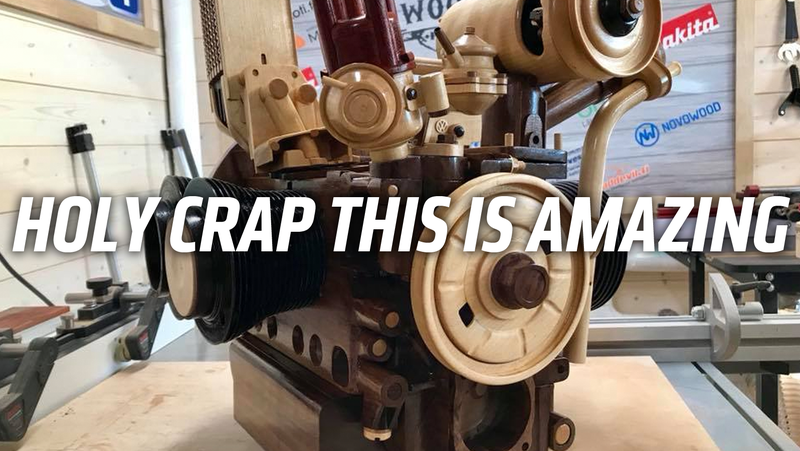 This is not just some wooden sculpture of a Volkswagen flat-four; this seems to be a complete wooden reproduction of the engine, inside and out. He’s carved the rotor inside the generator, and the brushes. He’s carved each individual, removable spark plug. There’s a real crankshaft and camshaft and valve train. He’s made wooden piston rings and everything is 1:1 scale, and it looks like you could bolt the real parts right to the wooden parts, everything is so accurate. This is insane. Insane and beautiful and stunning. He’s carved the interior of the oil cooler! who would do that? Again, this is astounding. Holy crap—look at the inside of this distributor! It’s got dual-port cylinder heads, and a generator—my guess is that this is based on a ‘71 or ‘72 1600cc engine. I don’t even know exactly what to say here. I feel like if you could somehow keep it from catching fire immediately and break some rules of physics, this thing could run like a normal VW engine. The amount of time and skill and care that this project requires is humbling to me. I’m amazed. I reached out to Tommi to find out more details about what he’s doing, but I didn’t want to wait to post this. If he gets back, I’ll follow up with more information, and hopefully find out what drove him to take on this project. In the meantime, I encourage everyone to just flip through these pictures and marvel.